All debit cards will be replaced with chip technology in 2017. Once your new chip card arrives, be sure to activate it for use and then destroy your old card as your current card will be deactivated in 60 days. If you are planning to travel internationally or have an immediate need for a debit chip card, please contact us at 866-372-1275. The embedded chip provides more security and wider international acceptance. 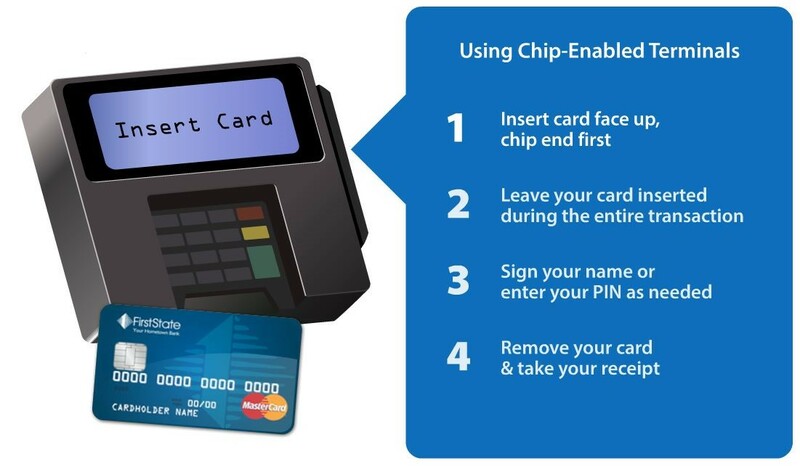 Card chip transactions offer advanced security by making every transaction unique. In addition, a chip card is more difficult to counterfeit or copy. If the card data and the one-time code are stolen, the information cannot be used to create counterfeit cards. In-store purchases made with counterfeit cards are one of the most common types of card fraud in the united States today. The process is essentially the same as at a merchant. Insert your card, leave it in the ATM and follow the prompts on the screen. A PIN is needed for ATM transactions. You will "swipe" your card to make your purchase, just as you do today. Chip cards will continue to have the magnetic stripe on the back. There is more security with no additional fees when you use your new chip card.